AppGratis’ daily deal business model involves taking money from developers who wish to promote their apps to its 12 million users and negotiating deals so that apps or in-app content is free for the duration of the offer. These sponsored apps are promoted along with unsponsored editorial picks selected by merit, according to AppGratis. However the company has faced criticism for how it operates and, more generally, for blurring the line between app discovery and app promotion. The two App Store clauses that AppGratis fell foul of relate to third party app promotions and using push notification for direct marketing. Whether AppGratis was banned for being too similar to Apple’s App Store is another possibility — however other app discovery services have not been banned from the App Store, suggesting it was the way the business was operating — not the general category of business — that was a problem for Apple. …we’re back to our roots. A crazy cool daily newsletter with millions of subscribers, that will very soon be complemented by the newest and nicest HTML5 WebApp you’ll ever see. Two things we fully own, and that no one can take away from us. So when I stated a week ago that the reports of our death were greatly exaggerated, I wasn’t kidding. Not kidding at all. AppGratis is just getting started. For all its fighting talk, the removal of push notifications is another hammer blow for the business — or at least its iOS business. (One can also wonder if Apple will cut AppGratis’ affiliate program soon too.) 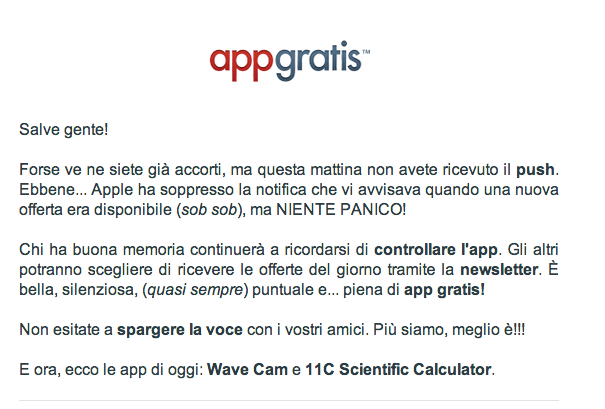 AppGratis could, of course, also concentrate on growing its Android app business (which launched in August 2012). It has had to adapt its business model for Google Play T&Cs, though, offering price-cuts rather than full price drops to free as apps that drop their price to free have to stay free. Going forward, AppGratis will have to rely on emailing its subscribers (and no one likes to be spammed via email too often) to inform them of offers. And, once it has its web app up and running, hope to persuade existing users to migrate to and keep checking that — without the ability to send native push notifications to them to generate the clicks.